Toiletry Bag. This bag includes deodorant, shampoo, conditioner, body wash, face wash, toothbrush and toothpaste, and some light make-up of lip gloss, mascara and blush. A curling iron/hair styling tool is in the bag too, cause who knows what my crazy mane will look like the day after labor. Pajamas/Nightgown. For me, pjs turned out to be a nursing gown by Mamajamas that I ordered off of Nordstrom Rack. Slippers. A pair of disposable hotel slippers will work well here. I can then throw them out before heading back home. Warm socks. You always need socks. A robe. I love silk robes and this one that I ordered off of amazon is perfect for my current, very round belly and for after. 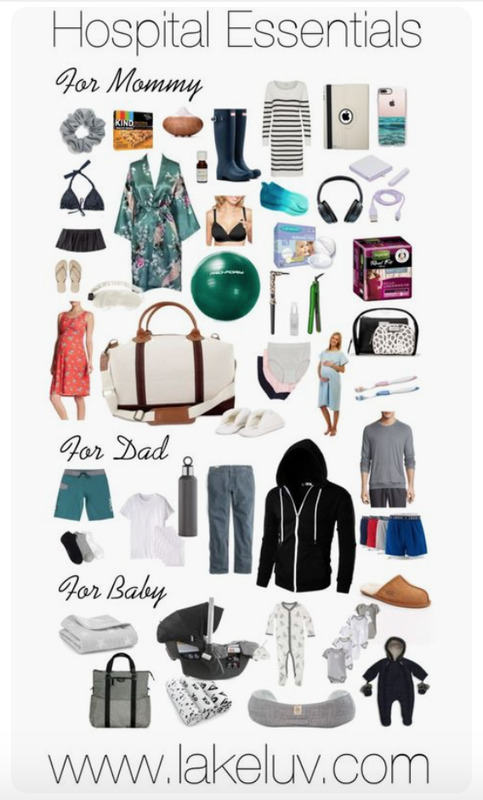 I figure the hospital will have towels, so a heavy terry cloth bathrobe would just weigh my bag down.The silk robe is also bound to look great in photos with baby. Eye mask. I hear nurses barge into your room at all hours of the night, and it can get quite bright in most hospital rooms. Headphones. In addition to hospitals being terribly lit, they are awfully loud. Noise canceling headphones should also help calm the nerves with some music and/or soothing Hypnobirthing recordings. iPad, iPhone and chargers. Enough said. Going home outfit. Since it's still chilly in Chicago well into April, I'm going to need a good pair of boots to go with a longish sweater dress. My doula told me that after labor and delivery, there is no way I'm going to want to wear any form of pants, so a long sweater dress will have to make do in lieu of pants. Actually, maybe I should also include some tall leg warmers too. Underwear. I went ahead and included both high rise, tummy tucking, granny underwear and a package of Depends. Things we have to do as mommies right? Nursing bra. I just got one, who knows if it will actually fit 2 weeks from now, but I figure it would be good to have at least one packed in my bag. Nursing pads. Because milk leaks happen — so I've been told. Exercise ball. I've been told the ones that the hospital provides have to be wrapped up in all kinds of plastic before they let you use it. I'd really prefer to use my own. Bathing suit. My hospital has a shower I can use during labor, you may have a tub or be doing a water birth. Either way, if I'm feeling modest, I like the option of having my bathing suit with me. Flip flops. Because no matter how clean the shower might look, someone else's feet have been in there. Hair scrunchies. You definitely don't have to go with an 80's type scrunchie like this one, but why the heck not? Essential oils (Lavender for it's relaxing and pain reducing qualities) and a diffuser. Who doesn't love a nice spa-like atmosphere while giving birth? Healthy snacks. If your doctor gives you the go ahead on snacking, you'll be happy you took something you actually to eat with you. Bathing suit. If you want hubby to massage your back while you are running yourself under some hot water during labor, he's going to need his swim trunks. Change of clothes. Undershirts, underwear, jeans, socks and a sweater should be sufficient. Pajamas. He'll appreciate something loose, long and warm. Toothbrush. He can use most of your toiletries if he needs, but packing his own toothbrush is a must. Couples who share toothbrushes weird me out. Sorry if this is you. Water bottle. Gotta keep him well hydrated. This labor thing can be like a marathon for most people I hear, including hubby. Car seat. Be sure to make an appointment at your local police station or fire department to install and inspect your baby car seat. The officer first checked to see if my brand new car seat was recalled or damaged. Then he showed me where and how to install it. I learned so much about the safest position for the car seat, baby, the seats that back onto the car seat and more. Blanket. You will need a blanket to place over baby while he or she is in the car seat. Diaper bag. This is more for your car than it is for the hospital. The hospital will provide you with everything you need while you are there, but your car ride home may require a quick stop for a diaper change depending on how far you are from home. Nursing pillow. If you plan on breastfeeding, getting yourself used to using a nursing pillow right from the hospital get go is suggested by most blogging mamas it seems. Swaddle blankets. Swaddlers can be used as burp cloths or you may want to wrap your baby up like a burrito. I hear the nurses can help you learn how to best wrap your baby if you bring your own. Onesies. These basic under garments will help keep baby warm under their pjs, swaddlers or onesie. One going home outfit. I chose a footed onesie that comes with a little hat so that I wouldn't have to pack socks, pants or another top. A snowsuit. It's still really cold here in Chicago, so I'm packing a snowsuit in the bag just in case we run into any car trouble. You don't want to put baby in the snowsuit, then in the car seat though — that's dangerous. Once you have the car all warmed up, you must take baby out of the snowsuit and buckle him or her in, then put a blanket over top. Puffy snowsuits create space between car seat buckles and baby, increasing the risk of baby flying out of the seat in case of a crash.